Septic systemc can vary in their components. 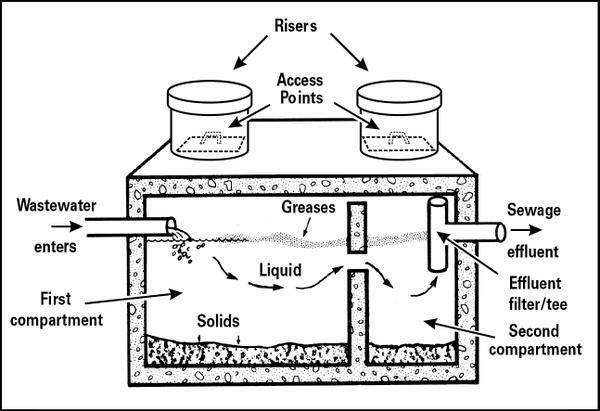 It is important to know why you have a septic system, and basic understanding of how it works. It is also important for you to know your particular system and each of its components. Knowing your system can help you maintain it correctly, increase its longevity, and prevent unwanted emergencies. If you are unsure what makes up your system, and if you are not already in our database, you can make an appointment for a septic system assessment. During the apointment we can educate you on your system including locating your system, and important maintenance requirments. A septic system is designed to treat the waste water from the home on the house's property so that the waste water is not polluting any ground or surface water source. Most septic systems have two major parts to it. The first part is the septic tank. The septic tank is there to allow any solids in the waste water to settle out from the liquid. The solids are stored in the septic tank until the tank is pumped out. The liquid portion of the waste water flows out of the septic tank into a treatment area. Conventional treatment areas are called tile fields. This refers to large amounts of pipes with holes in the bottom being laid in the ground with a special type of stone under the pipes. This allows the waste water liquid to be distributed over the stones and be filtered by the ground of any harmful elements before it makes its way back to the ground water table. There are two main types of tile fields. The first uses the native soil to filter the waste water, and the second uses soil or sand that has been trucked in for use as the filter. When soil or sand is trucked in it is because the native soil is not suitable as a filter for the waste water. Other treatment systems use methods that are able to treat the waste water liquid better then conventional systems in a smaller amount of space. This is done by using air loving or aerobic bacteria to treat the waste water. The bacteria are contained within a treatment unit that contains some form of filter media that the bacteria can cling to. Examples of filter media are peat moss like in the Ecoflo systems. Or foam sponges like in the Waterloo bio filter.The size of the septic tank that is used and the length of distribution pipe, or size of treatment unit, that is used is determined by factors in the home including number of bedrooms, square footage, and number of plumbing fixtures in the home. If your septic system does not have any type of dispersal or treatment for the wastewater it is called a holding tank. A holding tank requires emptying as often as it takes to fill the tank up with waste water.